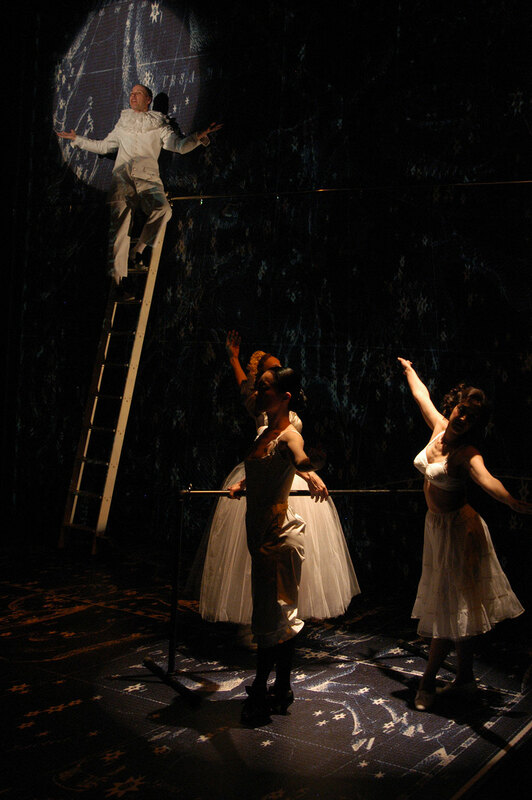 Created by Charles Mee, Anne Bogart and the SITI Company, Hotel Cassiopeia is a work of rigorous and unexpected juxtapositions and the search for the perfect articulation of the moments that make a life worth living. The American collage artist Joseph Cornell made wooden boxes filled with pocket watches, coiled springs, maps of the stars, a forest of thimbles, parrots, seashells, broken glass, children’s alphabet blocks, brightly colored balls, soap bubbles, whale teeth, a colored lithograph of the moon in the night sky and star fish. Like one of Cornell’s boxes, the play follows Cornell as he observes the city he so loved, overhears—and fabricates—parts of conversations, is inspired by movies and overwhelmed by the glorious bustle of Manhattan’s streets. And then, at one time or another, it seems that other characters come and go--whether in reality or in Joseph's imagination--a woman who might be named Marianne, a girl named Leila, Marcel Duchamp, a corkmaker, Gorky, Matta, Joseph's brother Robert, Lauren Bacall.